A paralyzed paraplegic woman was rescued from her Rottweiler named Eve seconds before the van she was in exploded. The cabin of the truck was beginning to fill with smoke, realizing that the truck could explode, she knew that she had to get further away. 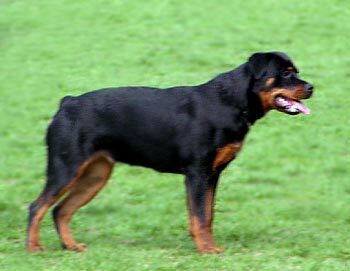 Vaughan began to panic, but suddenly realized that the Rottie had grabbed her arm and pulled her out of the truck. She credits her dog Eve for pulling her from van moments before the van burst into flames. The dog dragged her until she was far enough and safe from the damages the explosion caused. "When I arrived, the dog was pulling the lady through the grass, to get her away from the fire," said Trooper Mike Snider of the Indiana State Police. Vaughn said the heroics were second nature for Eve, even though she hasn't special training for working with the handicapped. "That's the true nature of the Rottweiler," she said. "They're very loyal and loving and will take care of their owners at all cost". Eve was awarded with a ‘Stillman Award’ for her bravery./desertnews/.